It’s been a long week, and here you are, still frantically thinking of all the things you need to do with the time you don’t have. But then, gentle rolling hills of moss beckon and soothe you, and all melts away. You breathe more deeply, soften your gaze. Plant your feet, feel the earth beneath you. This is the timeless appeal of the moss wall. Its subtle shades of green and grey evoke simplicity and peacefulness, while tiny details suggest an ancient, mysterious, but benevolent world beyond our understanding. A miniature landscape of moss and lichen invites you to forget your hurry- slow down, breathe deeply. 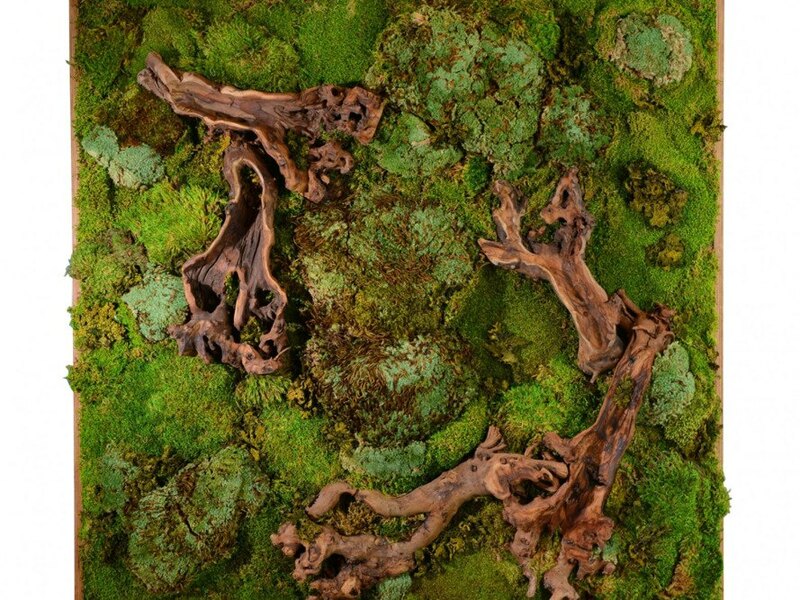 Moss walls are the latest trend in interior décor, but their secrets are very old. A thousand years ago, the Zen Buddhist monks of Japan delighted in the cool tranquility of the moss that grew in their temple gardens. They cultivated them on stones and walls, creating the sensation of expansiveness, freedom from clutter and daily distraction. For them, moss was an essential element: a symbol of harmony, age, and tradition that facilitated meditation. Contemplating landscapes was a path to enlightenment, a break from constant mental chatter, a quiet escape from busy practical concerns. Just as today, cities crowded the mind, and garden spaces were tight. Using simple stones and tiny plants, the monks created in miniature the oases of wildness they craved. Their gardens were small, enclosed, simple, and serene. These moss-covered shrines embodied absolute minimalism, distilling natural essence into a shelter for the mind and the body. Joe Zazzera and Pat Mahan are at the forefront of this lovely new trend in interior living designs. Joe and Pat are the long-time owners of Plant Solutions, a company that designs interior plantscapes in Arizona. Over 25 years of designing natural installations, they kept hearing clients ask for designs that did not require watering or maintenance, but still brought the sensation of nature into their interior spaces. They discovered that they could create dimensional art pieces that abstracted natural design, and complemented all kinds of interiors. 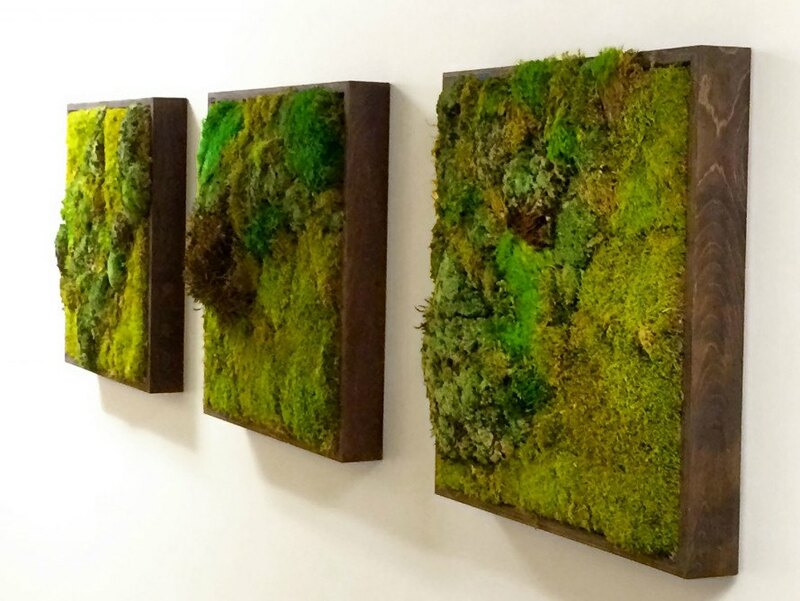 They began incorporating moss and lichen, along with beautiful and sustainably hand-harvested pieces of driftwood and other natural elements, into custom vertical pieces. Their work is stunning, and all are unique. In modern cities, where air pollution and artificial surfaces intrude upon us, mosses and lichens persist in the forgotten spaces between our daily frenzies — on roof tiles and between pavers, in sidewalk cracks, and along concrete walls. Lichens thrive in the leftover places of the world, too harsh for other creatures: frozen Arctic tundra, scorching dry deserts, rocky shorelines, poisoned slag heaps, and within solid rock. Lichens can voyage into space, become exposed to massive doses of ultraviolet and cosmic radiation, and return to Earth as happy as the day they left. When conditions are bad, mosses and lichens simply suspend animation, lying dormant until conditions are right. Then, they slowly reawaken, growing slowly but implacably to create new soil for new life. By growing together in cozy carpets an inch high, the humble mosses rely on each other to stay upright and moist. They fertilize and stabilize the soil, reduce flooding, and provide shade and shelter for insects and animals. These unassuming organisms have much to share, and a moss wall is a surprisingly restorative teacher. How many other pieces of art remind us to live gracefully with change, strive for harmony with an infinite present? Mosses and lichens show up where they like, not where we put them. They are not attached to outcomes, but follow opportunity as it comes. Mosses quietly endure, harboring the spirit of wildness despite anything time or humanity throws at them. 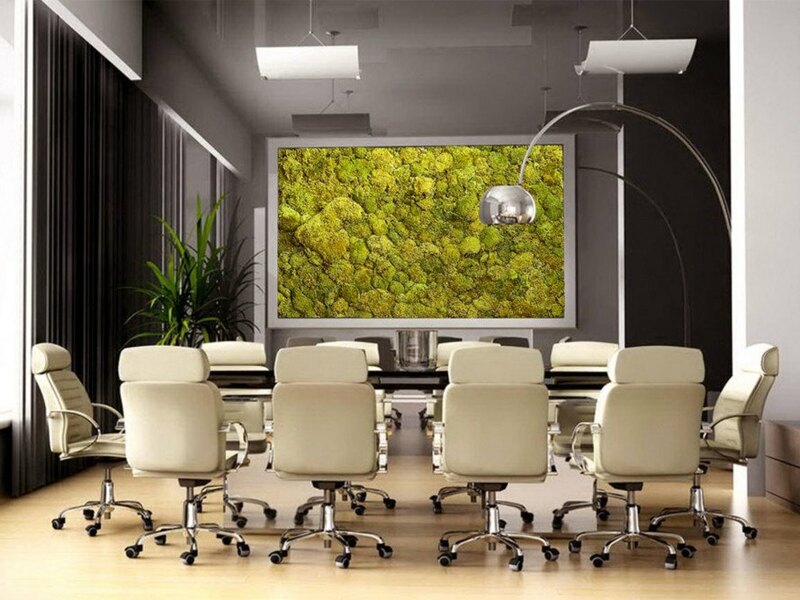 Let your moss wall transport you to an ancient place of simplicity and seclusion, a world of mystery and possibility. This miniature landscape invites you. Forget your hurry. Slow down. Stroll along the woodland banks of your mind. Chartreuse and bright green delight cavorts in clumps and mats in the shade of a waterfall. Soft olive-grey hair tumbles from branches and boughs, while ancient crags and boulders sprout shaggy pale-green coats. The gentle rolling hills of this tiny ancient landscape melt away your busy concerns. Breathe deeply. This is your shrine, the edge of your wilderness. Be here now — wherever you are. It's very shocking to find an article like this on a blog that claims to promote sustainability. What the author fails to mention or is perhaps unaware of is that ALL moss used for re-sale has been harvested in the wild (often illegally) from its natural habitat usually leaving trunks and branches bare and forest floors eradicated. Anyone purchasing or admiring a product which uses moss should be fully aware that they are contributing to the devastation of some of the most pristine landscapes and important ecological organisms. Unlike the people currently pillaging the forest for their moss, the Zen Buddhist monks mentioned at the beginning would likely be horrified at this current "trend". The lessons they gleaned from moss and applied to their way of life and perception were in the growing process and conditions rather than an act as simple as just gazing at mosses. Remember, preserved moss does not mean 'living' so yes you will have a beautiful garden that requires no effort but your moss wall is likely dead and dyed to look like living moss. I can't help not to be filled with dread every time I see this moss being sold and pinned up on the wall like a zebra head from a poacher. Here are a couple of sources if you'd like to learn more: "Gathering Moss" by the bryologist, Robin Kimmimer http://moss-musings.blogspot.com/2011/04/wild-harvesting-mossesfor-commercial.html http://oregonstate.edu/ua/ncs/archives/2004/aug/moss-huge-underground-market-ecological-concern This trend is careless, unsustainable and extremely short-sighted. Is the moss alive and if yes, do you soray it for watering??? Joe Zazzera and Pat Mahan are at the forefront of this lovely new trend in interior living designs. Joe and Pat are the long-time owners of Plant Solutions, a company that designs interior plantscapes in Arizona. ver 25 years of designing natural installations, they kept hearing clients ask for designs that did not require watering or maintenance, but still brought the sensation of nature into their interior spaces. They discovered that they could create dimensional art pieces that abstracted natural design, and complemented all kinds of interiors. Tiny landscapes of lichen and moss rest alongside wood and stone, mimicking the natural beauty of the outdoors, and bringing it within. In modern cities, where air pollution and artificial surfaces intrude upon us, mosses and lichens persist in the forgotten spaces between our daily frenzies -- on roof tiles and between pavers, in sidewalk cracks, and along concrete walls. Lichens thrive in the leftover places of the world, too harsh for other creatures: frozen Arctic tundra, scorching dry deserts, rocky shorelines, poisoned slag heaps, and within solid rock. Lichens can voyage into space, become exposed to massive doses of ultraviolet and cosmic radiation, and return to Earth as happy as the day they left.